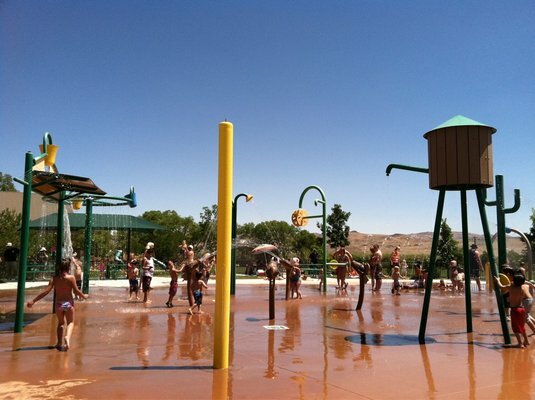 Get some relief from the hot summer sun with these places to keep cool in Northern Nevada and the Sierras this summer. 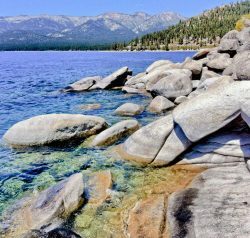 When it comes to hot summer days, Reno, Sparks and Lake Tahoe are not short on places to cool down. Whether it’s a local pool, a “sprayground” or a water park, you’ll definitely find something to do with your kids to help take the edge off the heat for you and your family. You don’t need the be near an ocean to beat the heat. In Northern Nevada and the Sierras there are several lakes, rivers, and streams to keep cool if you’re interested in taking your family to the great outdoors. Even though we’re technically in a desert, water is out there, IF you know how to find it. 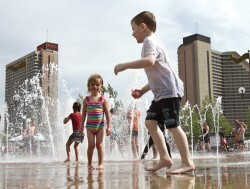 There are several free options as well several paid options to choose from to cool down this summer. Since a lot of families are on a shoestring budget, let’s start with the free activities and move into paid options. This location is perfect for the parent on the go. If your children do not know how to swim, this is a great place for a nice cool down and keep cool. Water shoots from the ground in various bursts and your kids can go running and play amidst the shower of spraying water to keep cool. This is one of my favorites that the Reno/Sparks area has to offer. Source: YouTube by username franchitreno. Source: Yelp user Joel T.
One of the things that I enjoyed while living in Alexandria, Virginia was a heavy emphasis on civic projects that the public can enjoy. One of those projects that my family enjoyed while we lived there is the Our Special Harbor sprayground located in the Family Recreation Area at Lee District Park in Fairfax County, Virginia. Reno has come close to the magnificence of Our Special Harbor as a way to keep cool with Lazy 5 Regional Park. Because I live in the South end of Reno, I have yet to take my kids to this location. However, the reviews on yelp suggest it’s a wonderful place to take my kids to play in the water on a scorching hot day. “Never have I seen my boys just turn off their brains and run away from me, arms flailing into the water. Reminded me of a cat chasing after a laser pointer. Lazy 5 Regional Park is located on Pyramid Highway on the north end of town. Be careful, and please note that the park closes at 5:00 PM daily. 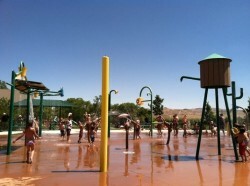 The Outlets at Legends is a great location to take your children for some water fun to keep cool. There are many fountains located throughout this shopping area. One in particular, in the center, has free-flowing water that children can play in. If you’re out and shopping, this might be a great place to take your young children. If they promise to behave during your shopping experience, they just might be able to play in the water. Or you can come just because of the water feature. Either way, your child is sure to have some fun here at this location in Sparks, Nevada. 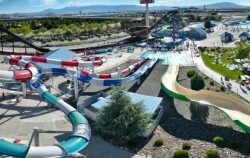 Wild Island is located in Sparks and is a long-standing Reno/Sparks summer tradition on how to cool off. With many water slides, a lazy river, a wave pool and a place for young children, you can’t go wrong with a visit to this location to keep cool. That’s not all. There is also a bowling alley on the property called Coconut Bowl and a go-cart track, when you’re done with the water play. 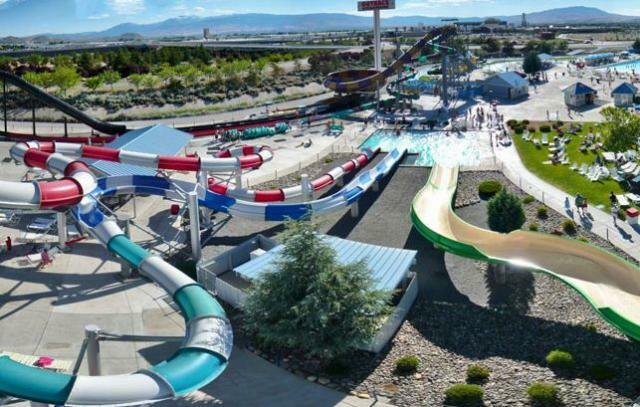 This is a family-fun destination in Sparks, if you’re willing to pay to play for the day. Many pools often are frequented by ice cream trucks throughout the day, so be prepared for a nice afternoon treat if you’re into that sort of thing by having some cash on hand to pay for ice cream for you and your children. Anywhere where there is water, it is always slippery. Make sure that your kids don’t run too fast or they might fall and hurt themselves. Also, hot days equal high UV rays from the sun. Please be sure to bring plenty of sunscreen to any outdoor location to keep your children from getting a sunburn. Lake Tahoe is a wonderful getaway for the day. 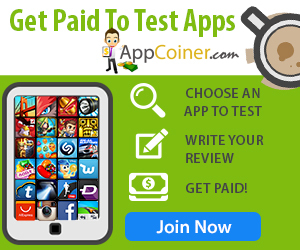 In fact we have a whole post dedicated to it. 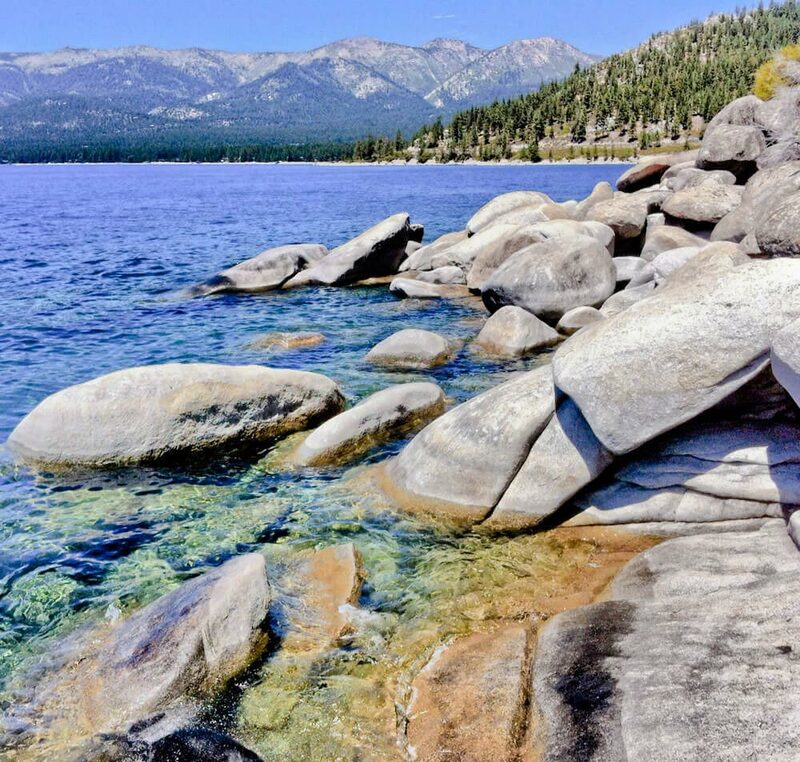 North Shore, South Shore, East and West all have great venues for Lake Tahoe “water babies” to play in the water and cool down and keep cool during any hot day. Pyramid Lake is located about a 30-45 minutes drive North of Sparks, Nevada. Surrounded by desert, this oasis is a great place to camp as well as cool down and keep cool. It’s a great place for fishing, boating, and swimming. However, be careful, there are various undercurrents and drop-offs very close to shore where people have mysteriously drowned in this Lake contributing to rumors and myths surrounding the lake’s reputation. I myself, have swam in this Lake, and can testify that it is not too dangerous. However there is a slight risk, just be careful and keep an eye on your children that they don’t swim out to far and keep cool by the shore. The Truckee River runs right through the middle of Reno and Sparks. There are several parks dotted along its path in it’s great for fishing as well as swimming to keep cool. Additionally, it makes for great day of tubing down the river as well. There are several companies actually market tubing and you can rent a tube to float on down the river. A nice relaxing day for anyone looking to get away in the middle of town. Source: YouTube by username Chris Nelson. Of course, this post cannot encapsulate every single body of water where you can keep cool that’s out there, but these are just a few to get you started in your search for quick cool down. There’s Lohantan Reservoir, the Walker River and Lake, Carson River (there are reports of Mercury in the water as a vestige of a bygone era of mining in Virginia City where they used mercury on the metals harvested from mines in the area, so please enjoy at your own risk), Topaz Lake and even Mono Lake if you find yourself outside of Reno or Tahoe. We hope you find this information useful for you to get out there and enjoy the great outdoors and dip your toes some cool water to keep cool. With that high heat of mid-Summer upon us we hope this helps you find a quick getaway for you and your family. What are some your favorite places to cool down and relax?